Summary: A consulting team that includes Convergence Design recommended a limited expansion of the Springfield (Mo.) Expo Center to a full-fledged convention center by adding a ballroom and new meeting space. An privately developed adjacent or attached hotel would also be part of the proposed development. A grassy patch of city-owned land sandwiched between the Springfield Expo Center and Jordan Valley Car Park was once supposed to help boost Springfield as a convention destination. The land sat unused for years after a development deal between the city and John Q. Hammons fell apart during the recession. Now community stakeholders are looking to revive a plan to transform the area into a convention center, complete with a full-service hotel. People packed into Tuesday's City Council lunch meeting to hear consultant Rob Hunden present his plan on how to make Springfield more competitive in the convention industry. His Chicago-based company, Hunden Strategic Partners, was hired by the city of Springfield, Greene County, Springfield Convention and Visitors Bureau and Downtown Council of Champions. Hunden's presentation explored hotel supply and demand in Springfield, how the city compares with others in the region, and what can be done to boost competitiveness. The Springfield Expo Center's most popular events, which include the Springfield Home Builders Association Home Show and the Sertoma Chili Cook-Off, can draw between 10,000 to 12,000 people. There's room to improve, Hunden said. Hunden said the current Expo Center doesn't have all the amenities that convention organizers look for. He recommended that the city rename the facility to the "Springfield Convention Center" and renovate the space to include a ballroom, kitchen and meeting rooms. Convention-goers also need a convenient place to stay, Hunden said. He said the city should incentivize a developer to build a hotel with 200 or more rooms on the patch of land in between Expo Center and nearby parking garage. 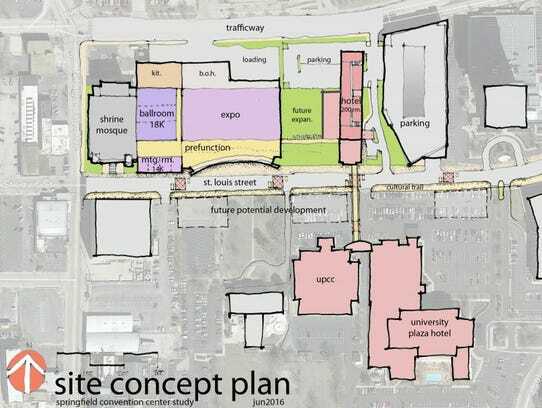 An illustration from the Hunden Report shows one possible configuration of the hotel and renovations to the Springfield Expo Center. In all, Hunden estimated $20 million of public investment is needed to develop the area. "We think the money you spend will definitely be paid back and will have significant impact," Hunden said. The report, which can be found online, estimates a convention center and hotel project could generate more than 600 full-time jobs and attract $912 million in new spending over the next 20 years. It's not the first time Hunden was hired by the city and other groups to talk about the same topic. In 2011, the message Hunden gave was "go big or go home." "You have to put a complete package together," Hunden said in 2011. "Don't fool yourself into thinking you have the cards to play, 'cause you don't." Back then, Hunden estimated the city needed to invest $24 million to $55 million into the project. Tuesday's presentation had a more positive spin. "Since 2011, downtown has exploded. You have a great situation in terms of something that's really a hook. Downtown has gotten more and more compelling," Hunden said. "The market has gotten better. Performance is better. It doesn't need quite all the bells and whistles we thought in 2011." 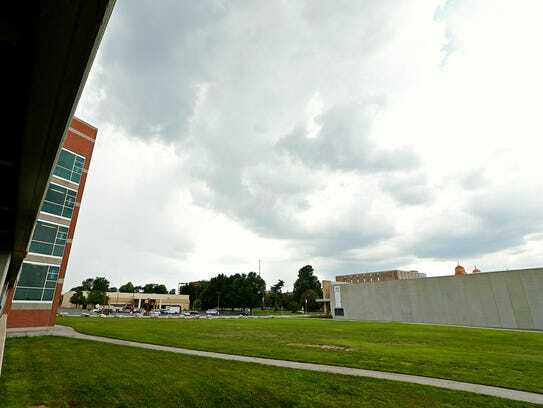 A consultant hired by the City of Springfield identified the currently open field in between the Jordan Valley Car Park and the Springfield Expo Center as a good location for building a new hotel, which would be part of the Expo Center complex. Since Hunden's last study, City Council has earmarked money for upgrades and repairs to the Expo Center. However, as the still-empty grass lot indicates, the city did not pursue any major investment projects that Hunden had recommended. Tracy Kimberlin, the head of the Springfield Convention and Visitors Bureau, said "the timing just wasn't right." Since 2011, Springfield's economy has rebounded and developers are interested in investing again, Kimberlin said. "We've already talked to developers who are interested in the project," Kimberlin said. "The hotel business has been great with the exception of group business .... We're falling behind other communities. Branson has become our biggest competitor in terms of meetings and conventions." Kimberlin said he hopes the city considers Hunden's recommendations seriously. "It's not something that is going to cost the city money, it will make the city money," Kimberlin said. "It will generate a great deal of sales tax that we don't have to pay as citizens." According to Kimberlin, Hunden was paid $39,000 for his most recent report. The city of Springfield and Greene County contributed $13,000 and $5,000, respectively, to Hunden's bill. The rest was paid by the Springfield Convention and Visitors Bureau and the Downtown Council of Champions.